Are you on holiday and wish to hold fit and wholesome? 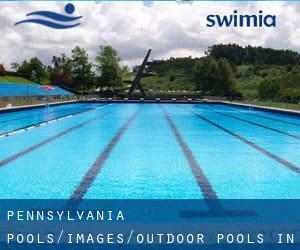 Swimia.com gives you the very easy and quickest way to come across pool near Pennsylvania. There are often discounts available to senior citizen and modest kids. Find out by contacting your nearest pool in Pennsylvania. Swimia.com has the most up-to-date database about Outdoor Pools in Pennsylvania. Thanks to some new Swimming Pools submitted every day, Swimia.com is escalating daily the number of stored pools. Please don't hesitate to get in touch with us when you discover any inaccurate or incomplete data. Water sports are escalating specifically in elderly population sectors who have suffered some style of muscle or bone damage. Most of the Outdoor Pools in Pennsylvania present both open lanes for independent swimming and also guided activities like water aerobics or aquabike. It's difficult to visit Pennsylvania without dropping by Allentown (with 118.032 residents). Currently Swimia is showing you all the Swimming Pool in Allentown and the closest pools situated in its vicinity. Let us tell you a secret to switch off whilst you happen to be in Pittsburgh: just select a Swimming Pool in Pittsburgh and plunge into the water! There's no alot more effective system. Swimming can be a excellent idea to keep your body active during your visit to Erie (Pennsylvania), or even if you are a local. Swimia helps you to find your closest Pool in Erie. 2546 Millrace Road , Emmaus , PA , USA (Postal Code: 18049). Among all of the activities offered by the center, if you are considering swimming you may appreciate 25 meters, 6 lanes, Indoor/Outdoor. Just in case you want to make contact with this Swimming Pool before dropping by, we only know the phone number. Updated on 2019 605 Cocoa Avenue , Hershey , PA , USA (Postal Code: 17033). This sports center provides 25 yards, 6 lanes, 11 feet maximum depth, Indoor/Outdoor. For this Swimming Pool, only phone number is number here. 251 W. DeKalb Pike , King of Prussia , PA , USA (Postal Code: 19406). This sports center delivers 22 yards, 4 lanes, Indoor/Outdoor. For this Pool, only phone number is number here. Updated on 2019 3200 43rd St , New Brighton , PA , USA (Postal Code: 15066). Swimmers like you reported 25 meters, 3 feet - 11 feet depth, Indoor/Outdoor. Unfortunately we do not have the email address of this Pool, but we can give you the phone number.